Want a quick and easy nutrient booster? Organic Sprouted Broccoli Seed Powder is rich with the goodness of that famous green vegetable - broccoli! We are dedicated to sprouting nutrition, suitable for everyday healthy living. Add 1 or 2 teaspoons to your smoothies, juice, sauce or soup. It's a great boost to salsas, salads and casseroles too. Our powder is a sneaky way to make sure your family is getting the healthy energy of green vegetables. Get all the benefits of broccoli, conveniently! This is our newest product! 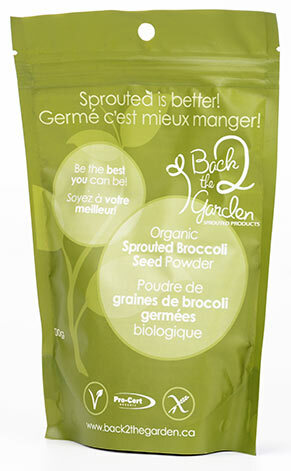 Our Organic Sprouted Broccoli Seed Powder comes in a 100 g package. We enjoy sprouting nutrition for your every day lives. Try our Organic Sprouted Broccoli Seed Powder today! Would you believe you could get all the nutrition benefits of a whole head of broccoli from just one teaspoon of sprouted broccoli powder? Sprouted broccoli is very high in phytochemicals. It is an excellent source of vitamin A, vitamin C and folic acid, all beneficial towards the body’s immune system. Sulforaphane is 50 times higher in sprouted broccoli seed than in mature heads. Sprouted broccoli is entirely glucose, lactose and cholesterol free, making it suitable for a variety of diets, including vegetarian and vegan. When added to energy drinks, soups, salads, stews or sauces, sprouted broccoli boosts your body’s toxin-fighting abilities.